The DRAGEN Complete Suite enables ultra-rapid analysis of Next Generation Sequencing (NGS) data for large data sets, such as whole genomes, exomes, and genes/panels. The DRAGEN Complete Suite* enables ultra-rapid analysis of Next Generation Sequencing (NGS) data for large data sets, such as whole genomes, exomes, and genes/panels. This application uses the DRAGEN Platform and includes highly-optimized algorithms for mapping, aligning, sorting, duplicate marking, and haplotype variant calling. 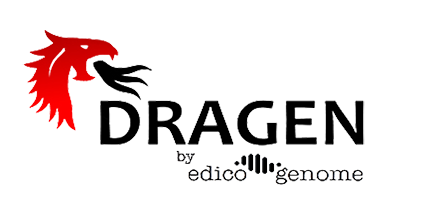 The DRAGEN CS includes a host of pipelines including our DRAGEN Germline V3 Pipeline, DRAGEN Somatic V2 Pipeline (T and T/N), DRAGEN Virtual Long Read Detection (VLRD), DRAGEN Copy Number Variant (CNV) Pipeline, DRAGEN RNA Gene Fusion, DRAGEN Joint Genotyping Pipeline, and GATK Best Practices. The DRAGEN Germline V3 and DRAGEN Somatic V2 pipelines have greatly improved accuracy in calling SNPs and Indels compared to industry standard. This app also supports Illumina NovaSeq BCL conversion, download/upload of data streaming, and compressed reference hash tables for a more seamless and efficient workflow.